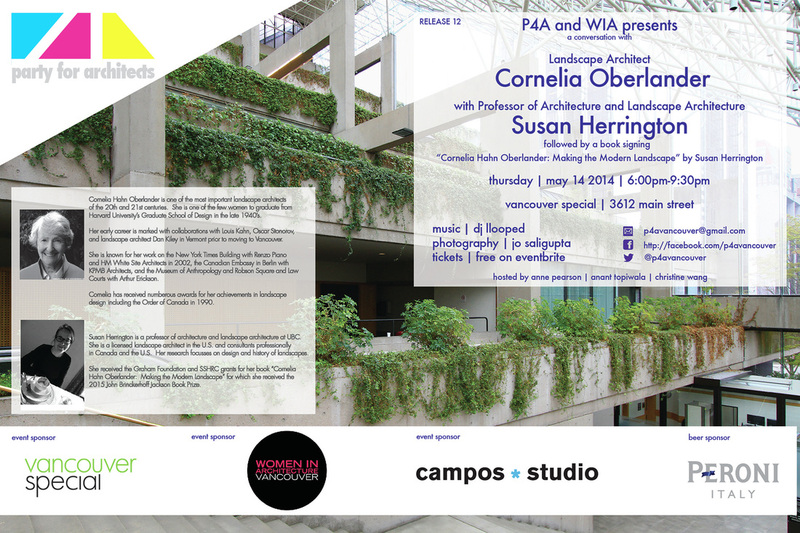 Women in Architecture Vancouver in collaboration with Party for Architects will host a presentation by respected landscape architect Cornelia Hahn Oberlander. At 93 she is still extremely active, flying all over the world to receive honours and awards, and give lectures. WIA x P4A is delighted to have Cornelia discuss her 60+ year career and will be joined by the author of her book “Making the Modern Landscape,” Susan Herrington. Copies of Cornelia’s books will be available to purchase ($45) and will be a great opportunity to get your copy signed. Drinks and light food will be available.